United Airlines, the Chicago-based US carrier, is launching the first-ever direct Tel Aviv-Washington, DC route beginning on May 22, 2019, the company announced on Thursday. 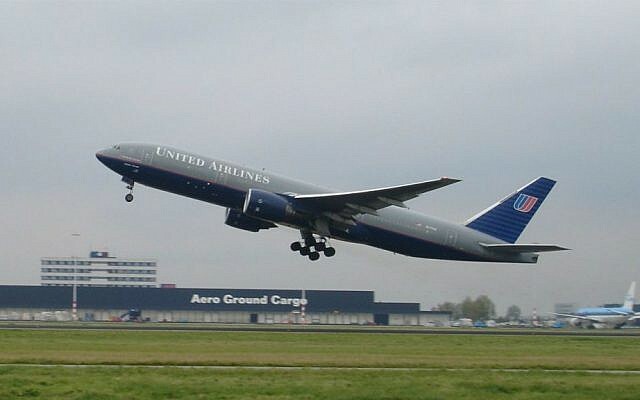 United, the third-largest airline in the world, already operates two direct flights between the US and Israel: two daily flights from Newark, New Jersey, and one daily flight from San Francisco. The DC link, which will launch with three flights per week, marks the third direct route for the carrier. “United Airlines today announced it will begin its 20th year of service to Israel with a new nonstop flight between its hub at Washington Dulles International Airport and Tel Aviv’s Ben Gurion International Airport,” the company said. In announcing the new flight, United posted a short video clip to Twitter of scenes from the Tel Aviv area popular with tourists, including the city’s beaches and Jaffa’s ancient port. The company said it offers more nonstop US-Israel flights than any other American airline. Its only competitor, Delta Airlines, operates a single direct route from New York’s JFK. A direct American Airlines route from Philadelphia was stopped in 2016 after the airline failed to drum up enough business to make it profitable.